It’s tax time, and you’re sitting on a pretty good tax return. You’re thinking about all the things you can buy with your tax return, but then you start thinking about the rust bucket sitting in the driveway. It’s not pretty, but it’s gotten you back and forth to work safely, gotten the kids to their doctor’s appointments, and even made a couple of trips to the mountains for a camping weekend. The car has definitely seen better days, and that tax return is enough to cover a down payment on a newer, safer ride. At the same time, you have built a certain relationship with your current car. There is a familiarity that you are uneasy about replacing. So, the question remains, is it time to replace or to repair? Are you in the first few years of a five-year auto loan? You must factor in the cost of repaying that loan or adding the remainder to a new loan. Consider the mechanical problems that your car currently has. Do you just need to replace the battery or older tires? Those type of repairs are inexpensive and can be done by a typical owner. Are your problems of a mostly cosmetic nature, such as ripped seats or a faded paint job? Consider putting some of that tax return money into detailing the car and making those small improvements. As a general rule, if the car repair estimate is less than half of the vehicle replacement cost, it makes sense to make the repairs and hold on to the car for a little while longer. It might just be time to trade in your old car for something newer. If you are spending more time in the repair shop then on the road, it’s time to move on. Your vehicle is your primary method of transportation and needs to be dependable and safe. Is there a risk that your current vehicle could leave you stranded on the side of the road with your small children? Spending $2000 a year to keep a vehicle worth $3000 on the road is not a sound investment. At this point, it is time for you to find a replacement. That $2000 you are spending to keep that car on the road can translate into about $160 a month towards a newer, safer car. Take a long look at your situation. If your tax return is enough to put a down payment on a car and it is in your best interest to do so, there is no better time then tax time to get you back on the road. 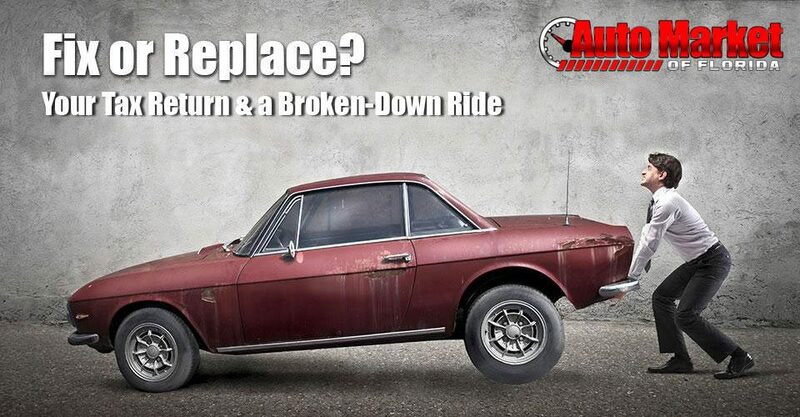 Consider replacement if you are sinking more money into your car than it is worth. If your main complaints are visual appeal, consider putting some of that tax return money into fixing those minor issues and save the rest for a newer vehicle when the time is right. Whichever way you decide to go, make sure you weigh the pros and cons of keeping or replacing your car- including maintenance, insurance, and property taxes. If you decide that replacement is the right choice for you, check out our huge inventory of quality pre-owned cars. Contact us today to schedule a test drive.